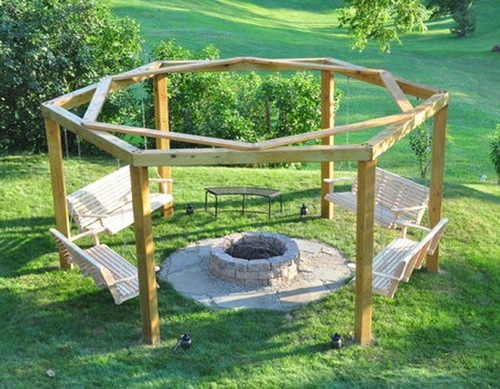 This fabulous porch swing fire pit project is exactly as cool as it sounds…a comfortable porch swing constructed around a fire pit. Actually, four bench swings suspended around a large fire pit. Wow, sounds like an excellent addition to any yard! If temperatures are starting to decline in your neck of the woods, your thoughts may be turning to indoor activities but…for the next couple months you can get away with a few more outdoor gatherings as long as you have a good fire going. You’re going to need a bit of construction skills and a little knowledge of pouring concrete with this porch swing fire pit project, but if you follow the instructions you shouldn’t have much trouble building your own awesome gathering place to enjoy the outdoors, a blazing fire, and the company of others.